I managed to take in a couple of Arizona Fall League games on Saturday. With the caveats that I am not a scout and that any given player may perform better or worse than he normally does in an individual game, here are one man’s observations from the Valley of the Sun on this particular day. Both starting pitchers struggled with their command. Mesa left-hander Robert Carson (Mets) went to three-ball counts on 6 of the 13 batters he faced. Peoria right-hander Eammon Portice (Red Sox) did the same on 6 of 15 batters. The relievers weren’t any better. Give the hitters some credit, but not too much. When people complain that baseball is boring, they are talking about games like this one. No pace, no flow. Everything takes more effort than it should. 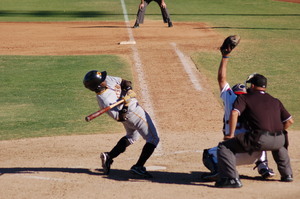 Josh Harrison of the Mesa Solar Sox ducks away from a pitch in a November 13, 2010, contest against the Peoria Javelinas at Peoria. Shortstop Andrew Romine (Angels) batted second and hit two doubles. Both were more a matter of placement than power. Third baseman Josh Vitters (Cubs) didn’t do anything remarkable, but he made solid contact in all six trips to the plate. He also stole two bases. First baseman Matt Rizzotti (Phillies) is huge (6’5″, 235 lbs) and patient. He drew four walks and struck out on a 3-2 pitch in his other plate appearance. He saw 26 pitches in the game: 19 balls, seven strikes. Right fielder Andrew Lambo (Pirates) hit the ball hard several times. He singled twice but also drove two line drives deep to center field for outs. Right-hander Chris Carpenter (Cubs) worked the fourth inning. His final line was mediocre but he was the only pitcher on either side with eye-popping stuff. His fastball was audible on hitting the catcher’s mitt and he backed it up with a sharp slider that made Nate Tenbrink (Mariners) look horrible. For the Javelinas, pitcher turned right fielder Adam Loewen (Blue Jays) didn’t look completely lost at the plate; neither did he do anything to distinguish himself. He’s a longshot to follow in Rick Ankiel’s footsteps but it’s hard not to root for a guy like that. First baseman Mike McDade (Blue Jays) is built like Prince Fielder (6’1″, 260 lbs). He singled twice and tripled off the wall in left-center that center fielder Kirk Nieuwenhuis (Mets) lost in the sun. It was a special moment, because McDade probably will never hit another triple in his life. 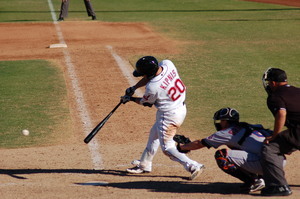 Jason Kipnis of the Peoria Javelinas strokes a double down the left field line in a Nov. 13, 2010, contest against the Mesa Solar Sox at Peoria. Second baseman Jason Kipnis (Indians) put on a show. There were two afternoon games on Saturday, with the choices being one in Surprise (where Bryce Harper’s team was playing) or one in Peoria (where Dustin Ackley’s team was playing). Ackley is closer to the big leagues and is destroying the AFL, so I chose Peoria. Kipnis got the call instead and went 4-for-4 with two doubles. He singled up the middle on an 0-2 pitch in the first, doubled to deep right-center on a 3-2 pitch in the fourth, grounded a double just inside the third base line in the sixth and lined a sharp single to left in the seventh. He appeared to have a plan at the plate and the ability to excute it. Kipnis also played a passable second base. He was charged with an error when his flip to shortstop pulled Jose Iglesias (Red Sox) off the bag in the seventh. Two innings later, his team clinging to an 8-7 lead, he made a terrific back-handed stop on a ball off the bat of Vitters with the bases loaded and fired a strike to Iglesias to end the game. If the Padres don’t yet regret failing to sign him in 2008, they will. The facility at Camelback Ranch Glendale is gorgeous but still has that factory showroom ambiance that time should fix. 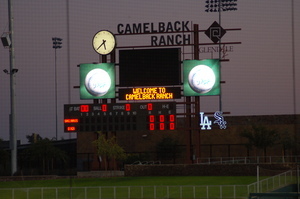 The nightcap took place at the new (opened March 2009) Glendale facility that the Los Angeles Dodgers and Chicago White Sox now call their spring home. The ballpark is pristine, if lacking in the character that comes from having been inhabited for a fair amount of time and stories being told. It was announced beforehand that in order to protect the available pitchers, the contest would end after seven innings regardless of score. Peoria center fielder Ben Revere (Twins) led off with a first-pitch check-swing tapper in front of home plate. He saw eight pitches in three trips to the plate and never hit the ball out of the infield. Shortstop Eduardo Escobar (White Sox) didn’t do anything at the plate but looked good in the field. No single play stood out; he just seemed to get to grounders without exerting much effort. You’d look up and the play was done. Then you’d look back at where he started and think, huh. Second baseman Kristopher Negron (Reds), batting fifth, crushed a homer to left-center to lead off the fifth. The man following him in the lineup, designated hitter Chris Parmelee (Twins), drove a ball 380 feet to the left field wall in the second. No one else did much. That’s what happens when your team loses, 8-1. For the Desert Dogs, center fielder Trayvon Robinson (Dodgers) had a different approach to leading off. He drew a bases-loaded walk and stole second in his first trip. He later doubled and singled. The heart of the Phoenix order did damage. Left fielder Jerry Sands (Dodgers), batting third, homered over the 410-foot sign in center field in the first. The cleanup hitter, first baseman Stephen Parker (A’s), doubled to deep left-center in the third and homered in the same general vicinity three innings later. Sons of former big leaguers? Sure, they were there. Third baseman Ivan DeJesus Jr. (Dodgers) and catcher Matt Wallach (Dodgers) each drew a walk. Wallach also knocked a broken-bat double over the first baseman’s head in the sixth that looks better in the box score than it did in real life. On the pitching front, sidewinding right-hander Cory Gearrin (Braves) pitched well. He served up the homer to Negron but then retired six of the final seven batters he faced, including four via strikeout. Gearrin got Escobar to chase a particularly nasty slider down and in in the sixth. If you ever find yourself needing a baseball fix in November and it’s at all feasible for you to do so, head out to the AFL. It’s cheap, it’s fun (even when the game drags a little, you’re still at a ballpark), and you may be able to say that you saw the next big thing before most folks had heard of him. Not everyone will pan out, but you never know when you are watching future greatness. The AFL has been in continuous operation since 1992 and has its own Hall of Fame that boasts an impressive collection of big-league stars. Had you been in Phoenix in any given November, you could have gotten a sneak peak at these players, in an intimate environment, before they became household names. Interesting stuff Geoff, I think I would have made the extra drive to try and see Harper. Not sure we’ve seen that level of hype in some time, it is going to be interesting to see how he developes and how long Washington is willing to give him in their system. I’m guessing it’s under 2 years. We’ll all lucky he didn’t end up dropping in the draft to either Boston or NY because the hype machine would literally be out of control. Mark, believe me, it was a tough call choosing between the two. Had I known Ackley was sitting, I would have gone to Surprise. Heck, I toyed with the idea of leaving mid-game to go over there anyway, but after 3 1/2 hours of driving, I was content to sit and watch the Jason Kipnis show. On the bright side, I’m told that Harper didn’t do much on that particular day.